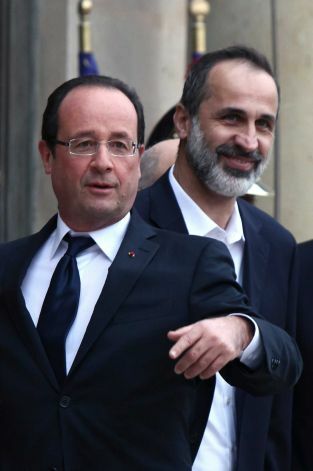 French President François Hollande has just eaten his words on arming the Syrian opposition. He said overnight he was unsure if weapons supplied to opposition rebels would not fall into the hands of jihadists. At the European Union summit in Brussels two weeks ago, Hollande and British Prime Minister David Cameron were both pressing for the relaxation of an arms embargo on Syria so that arms can flow to outgunned rebels fighting regime forces loyal to Syrian President Bashar al-Assad. The embargo expires on June 1 and both leaders said it should be allowed to lapse. Speaking in Brussels on March 15, the French president said he had received guarantees from the Syrian opposition that any future arms delivered to them will end up in the right hands. “In terms of delivering weapons … to have the best answer the opposition must give all necessary guarantees. It's because we have been given those that we can envisage the lifting of the embargo. We have the certainty on the use of these weapons,” he said two weeks ago. But Hollande backpedaled in his Thursday night interview on France 2 television, telling anchorman David Pujadas: “There is today an embargo, and we respect it. The Russians violate the embargo, and that’s a problem. “In the past two years, almost 100,000 people were killed in Syria – 100,000. There’s a radicalizing civil war and jihadists are seizing the opportunity to batter Bashar and accumulate credit points for the future. “No arms can be delivered when the embargo lapses, which is end-May, if we cannot ascertain that such weapons will be used by legitimate (regime) opponents only and held back from any terrorist enterprise. Muhammad Ballout, writing today for the pro-Assad Beirut daily as-Safir, says Hollande’s remarks last night are “light years away” from his statement two weeks before in Brussels. Ballout attributes the French president’s change of heart on arming the Syrian opposition to news that many weapons supplied to rebels in Libya have since turned up in the fighting in Mali. So it looks like Hollande subscribing to Barack Obama’s “paralyzing caution” on Syria. In the matter of the Syrian rebellion, the U.S. hasn’t even “led from behind.” The Obama administration has pioneered a new role for a great power: We are now the traffic controllers, directing the flow of weapons to the rebels. The money isn’t ours; it is Qatari and Saudi and Libyan. The planes hauling the weapons are Jordanian, Qatari and Saudi. And Syria’s neighbors, principally Jordan, Turkey and Lebanon, run the risks. Our officials have opinions on Syria, but no one in the Greater Middle East can divine them. We want Bashar al-Assad gone -- our president said so in August 2011 -- a full five months into a brutal war. Then again, through winks and nods, we suggest that the alternative to Assad might be worse than his despotism. No sooner do we make one definitive statement against the dictator than we hedge it with an invitation to both the dictatorship and the opposition to come to the negotiating table. Great crimes are committed by the Syrian regime, but we are full of worries about the jihadists who have converged on that country. For American officials, the lengths of the fighters’ beards, one Syrian opposition leader lamented, are more important than the massacres.